Join the discussion on our forums! 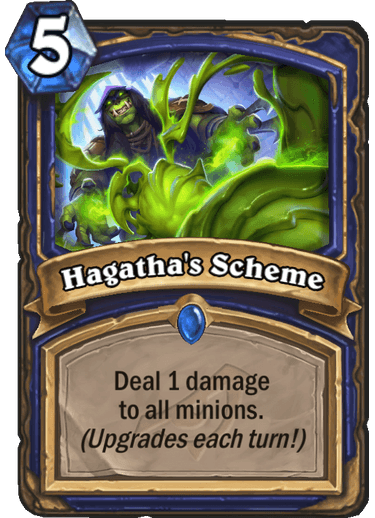 Come discuss Hagatha's Scheme over in our dedicated Hagatha's Scheme discussion topic. "All shall suffer!" "But Hagatha, those are your minions..." "I said ALL!!!" God I feel sorry for Shaman enemies. At least nerf this to Deal 0 damage at the start so they can catch up. Shaman rarely gets such clean mass removal, so I foresee this card seeing play for its entirety of its standard lifespan. Potentially an amazing removal tool, even at it's base level it could potential be upgraded by spellpower for emergency damage. And if you get to hold it for 3-4 turns, it pretty much kills most flooded boards.